Employees are seeking organizations with office space that makes them want to come to work. After all, it’s no secret that productive workspace influences employees wellbeing, creativity and engagement. So you must ask yourself, does the purpose of my workspace work for me? If the answer is no, keep reading. investment that is measurable and meaningful impact on your people. Our experts created a five step fitness program that allows you to assess, set, choose and analyze your workplace fitness experience. The workplace performance survey identifies the top seven features of the corporate workplace that enable an enterprise to attract and engage their people and outperform the market. The online survey gives you the opportunity to assess your current performance against seven key workplace fitness factors – privacy, amenity, technology, interactivity, adaptability, flexibility and identity. 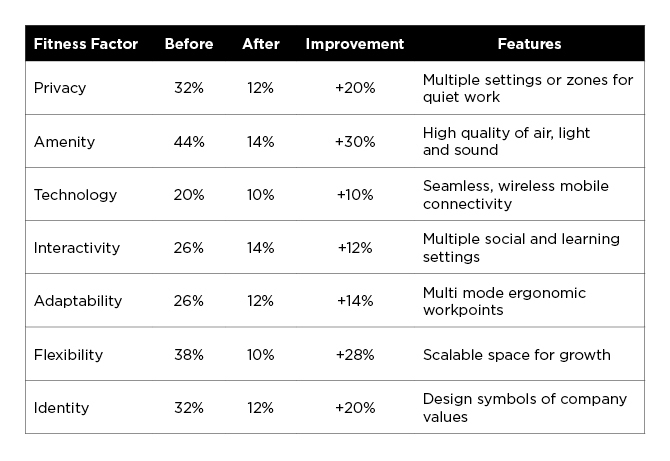 By measuring the relative importance and performance of workplace features before each project we can list the top factors that determine the fitness of a workplace. We have analyzed data gathered from more than 5,000 people working in corporate offices who have undertaken our Workplace Fitness Test survey in the past 15 years. 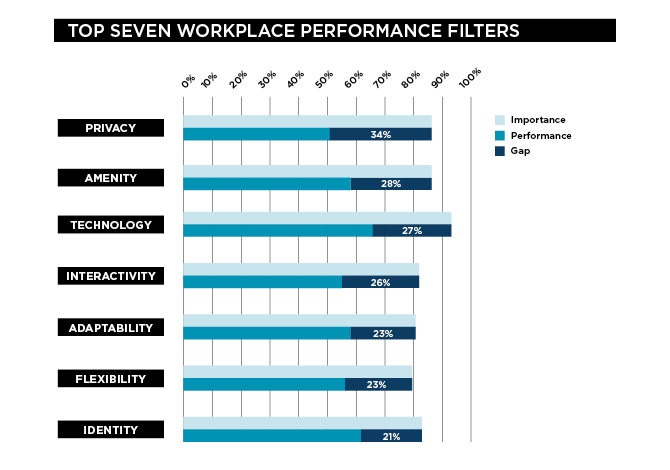 The results for the top seven Fitness Factors are shown in the graph, ranked by the average workplace performance gaps. After the baseline is assessed, set your goals next. To reduce the workplace performance gaps that matter to you, focus on the activities with the highest impact. Based on more than 15 years of experience we have determined the key activity affected by each Fitness Factor, and the impact it can have on behavior and performance. Consultation, observation, brainstorming, utilization and activity studies will diagnose the unique features of your enterprise, both strengths and weaknesses, that can be enhanced with the right intervention in the workplace. the acoustic and physical isolation needed for highly productive focused work. Frequent disruption is observed due to the activities of other occupants, yet there is typically no alternative setting to work in. A high performance workplace has work settings that enable more focused, individual work. Amenity is a factor of occupant comfort, with a direct impact on productivity. Research on indoor environments shows that the quality of air, light and sound has a high impact on mental and physical function and wellbeing. Unwanted noise, glare and thermal discomfort are very disruptive to productivity. This factor is the source of most complaints to building managers and so the performance gap in most buildings is high. Any improvement in the quality of this environment has a big impact on satisfaction. Technology that supports knowledge sharing and connectivity is the most important factor in workplace performance. Most existing workplaces also perform poorly in this criteria, partly because information technology is rapidly advancing. Mobile devices and applications have enabled high mobility and continuous remote access to networks and data, raising expectations of workplace infrastructure. This rapid obsolescence can be overcome by wireless networks and policies such as “bring your own device,” with evident security risks. As these tools help people to be more connected and yet mobile, occupants now expect seamless connectivity between work settings with universal docking stations, multiple screens and fully integrated AV systems in meeting and collaboration spaces. Interactivity of workspaces encourage interaction, socialization and collaboration. These activities often conflict with privacy in an open plan office resulting in a high performance gap. Research has shown a clear link between high levels of social, collaborative and learning behaviors with high levels of enterprise performance. Interactive space allows people to easily and efficiently switch between a variety of work modes which helps them be more productive and creative. Adaptability is a factor that measures the ability of occupants to choose or adapt their workspace to the task at hand. People need to move easily and efficiently between a wide variety of work settings to help them work in ways which are more innovative and creative. Other features of an adaptable workplace are ergonomic furniture that adapts to a range of body types and postures (e.g. sit to stand desks). A versatile desktop or meeting room set up allows seamless movement from one work setting to another. Many studies show that personal control of the work environment is a key factor in occupant satisfaction and productivity. Flexible office space is one that adapts easily to changing team structures and activities. A desirable feature is the ability to accommodate growth in headcount by adapting workspace to higher density at peak periods or over time, with minimal alteration to fitout. Flexible lease terms that permit expansion or contraction with low penalties, or provide access to additional meeting rooms, project space or co-working space are other cost effective ways to future proof your workplace. highly the enterprise values knowledge, continuously learning and creating things. With a fitness program in place, the hard work starts. As the workplace fitness program progresses, the goals identified in the planning stage enables your employees to perform better in the new environment. However, adapting to a new environment doesn’t happen overnight. Here are three things to consider when changing workspace environment. Create a pilot program. A pilot program allows a small group of employees to experience the new physical environment over a short period of time. It also gives you the opportunity to collect positive and negative feedback, and adjust accordingly. Start slow. Changing the physical workspace is only part of the program; you need to move hearts and minds too. A new environment requires a new mindset. Employees need time to adjust to a new environment. Listen to your corporate organism. If employees are feeling pain, what are their pushbacks? Encourage employees to share feedback and actively listen. By including everyone in the journey from day one, all participants have an opportunity to influence the fitness goals so that the solution addresses the issues that matter to them. workplace. A high performing workplace is sustainable if you continue to work at it. Take the test every year. There is always room for improvement. in mind and you can make an investment that will have a measurable impact on your people, with higher levels of engagement, wellbeing, innovation and productivity. Other performance indicators that really matter include reduced training and recruiting costs due to lower turnover, and higher revenue and profit per person. The above is an excerpt from the Fourth Edition of the Occupier Edge. To learn more about workplace performance and well-being , download the full report here.